Why do Asagi's eyes change color? Is this change actually occurring or is it an animation error? 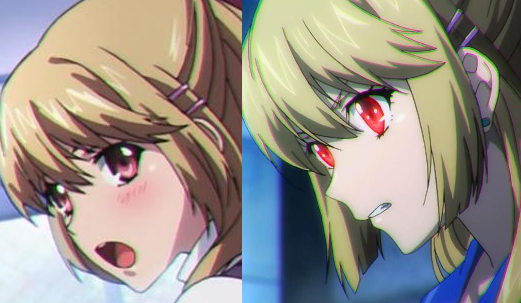 If it is real, what is the meaning behind her eyes changing color? On that site, it says her eyes are red. Due to the second season, she is the Cain Priestess (the impersonation of the Itogami island). So it is the visual effect of waking her power up for being able to hack an unhackable (great example is when she fought against Lydianne Didier (The Tank Rider) in the second episode of the second season). Then also author told us that Asagi is the Cain Priestess directly. Not the answer you're looking for? Browse other questions tagged strike-the-blood or ask your own question. Why Akatsuki Kojou almost always use Regulus Aurum familiar for attacking?